Still can’t get over the death of a very close friend. I know eventually we will all die but I’m sad that he’s gone too soon. He never failed to make us laugh, never a dull moment with him. It pains me a lot knowing we won’t be together again. Your death has left a gap, but we will fill it with good memories. 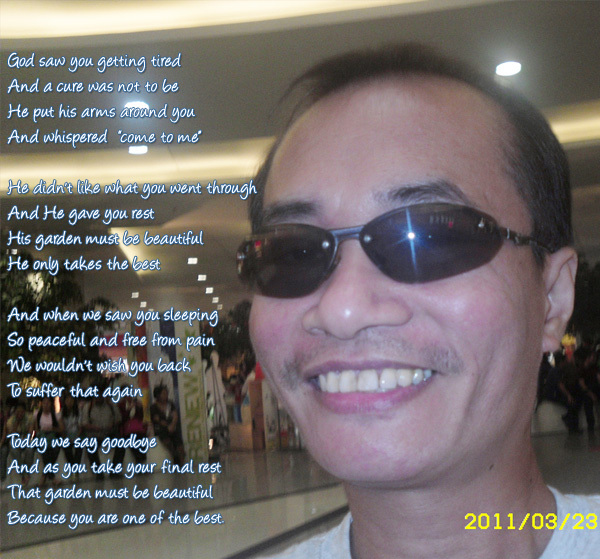 We will miss everything about you Kuya Tito. You’re one of my best friends. You’re the big brother I never had. Thank you for being a real friend through thick and thin. I know you’re happy now, you’re in a better place where there’s no pain, no sufferings. We may have lost you here on earth but you’ve gained eternal life. While we are mourning, the angels are eagerly waiting for you. Someday we will all be reunited in our Father’s house. Time will gradually help us learn to deal with our loss and continue to move forward. Tears will secretly flow as we remenisce your memories that will stay forever in our hearts. Hello Amor, regret read the passing of your good friend. Be now forever taken from our sight. Of Glory in the flowers. Rather find strength in what remains behind. Very sorry to hear of your loss. It is never easy to get over it completely for sure. I am very sorry to hear this, just last year around this time I lost my big brother to Pancreatic Cancer. A life taken far too soon, for me and my family.